A day for the committed! 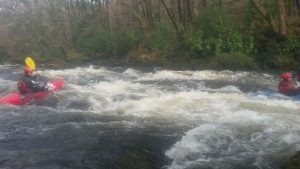 A full river (i.e. flooded upstream), low tide and strong wind gave a very dynamic environment where situational awareness was just as important as boat control for safety. Getting down to the harbour via the Western Arm was pretty easy, not least because nearly all (15?) 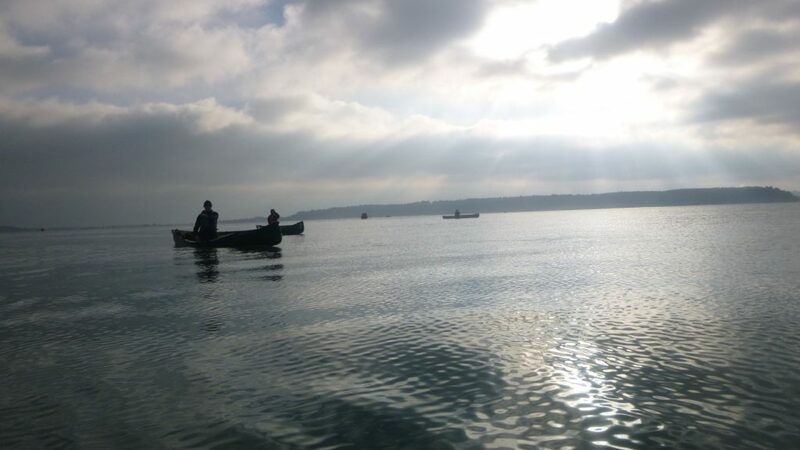 of us were in longboats of some sort or other – the exception being Adie and Robbo in a tandem open and Andy Hall (!) in a playboat. By Emerald Quay we could start to see the incoming tide winning out against the river in terms of flow. We hung around Soldiers Point for a bit and then some of the more experienced headed out by the National Coastwatch lookout and tried to catch some waves along the West Pier. The rest of us watched the two lifeboats return to their station and then initially headed for Kingston Beach before changing the plan and heading for the Hole-In-The-Wall. There was a big swell but not much by way of surfable waves even along the Eastern breakwater. At this stage the offshore wind was just about enough to cancel out the incoming tide so without paddling we would just bob about in the harbour. 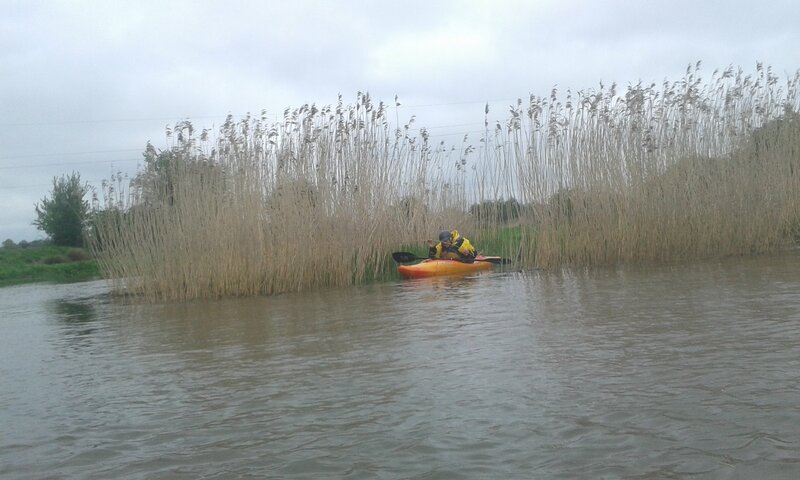 For the return up the river we had plenty of tidal flow behind us but we were paddling into a fair bit of headwind and even by Silversands without paddling we were being blown back to sea. 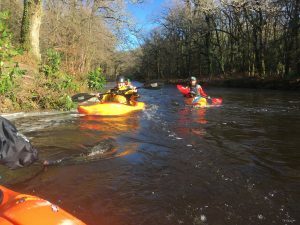 An efficient and effective forward paddling stroke comes into its own in these conditions and is why we can never do too much forward paddling practice to overcome the lazy ways we slide into! All made it back OK and the importance of giving the moored boats a wide berth was highlighted by one breaking one of its lines as we passed and doing a sudden and dramatic 180 turn. With a vibrant canoe sect in the club and several members working towards their Canoe Leader award John had planned an Open Canoe Whitewater Weekend on The River Dart for Jan 19/20. But as they say, ‘man plans and God laughs’ and as the weekend approached it became clear that the rivers in the southwest would be empty. 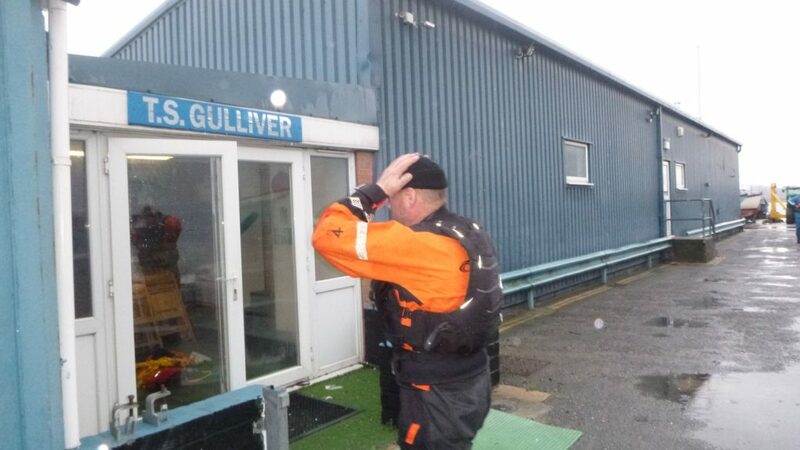 TS Gulliver (the Lilliput sea scouts hut) turned out to be perfect for our (very unsophisticated) needs; it was warm, dry, had hot water, drying space, beds and most importantly its own slipway into Poole Harbour so there would be negligible need/distance for boat carrying. 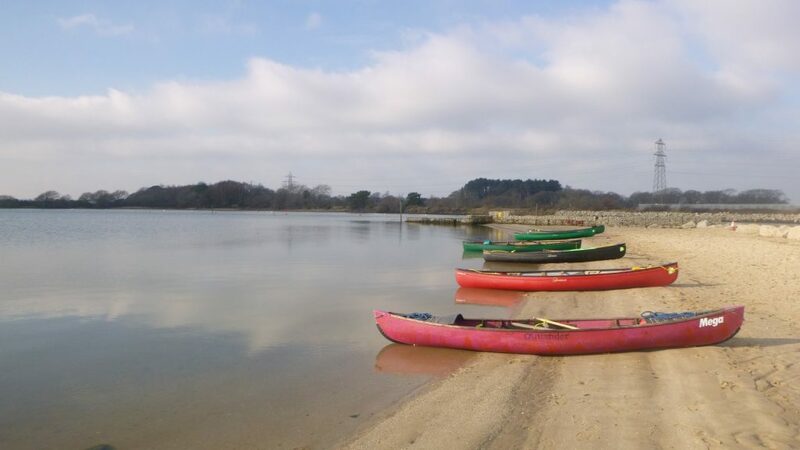 Most peculiarly for an ACC trip we all rendezvoused in a pub on the Friday night – all bar Neil who was having car trouble but still hoped to join us in the morning – and made a loose plan, subject to the weather not changing overnight, of circumnavigating Brownsea Island on Saturday. On Saturday the weather was still as anticipated but unfortunately Neil still had car problems and wouldn’t be able to join us. 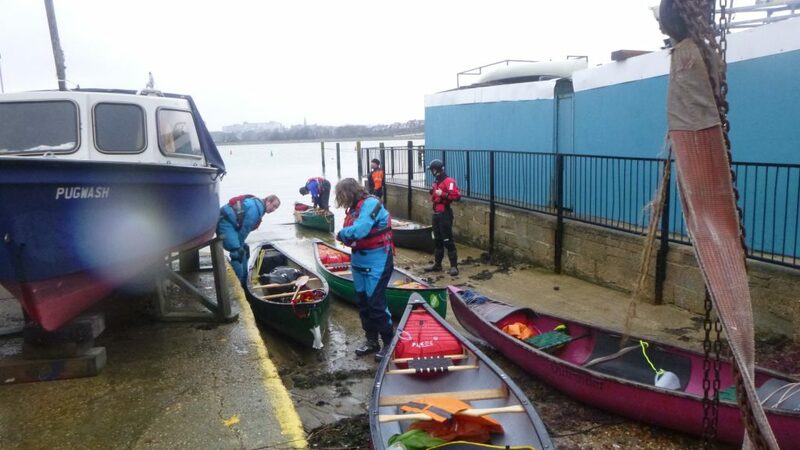 Through some bizarre set of circumstances, we ended up on the water 10 minutes ahead of schedule at 08.50 in cold, drizzly and blustery (properly dreich?) conditions. 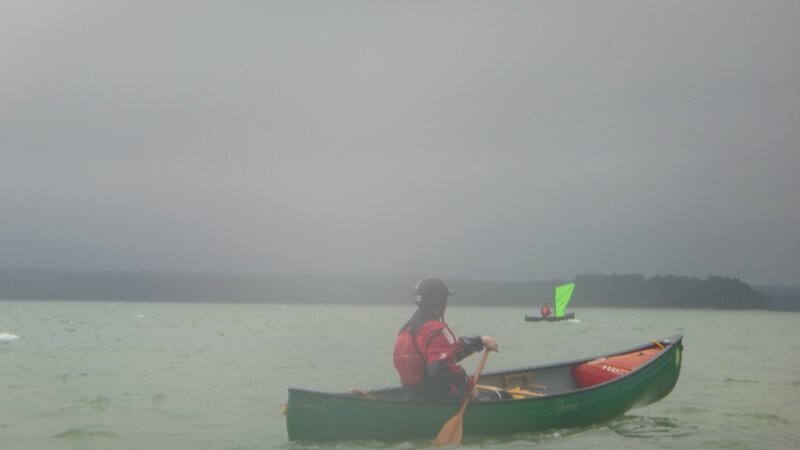 Crossing the harbour to Brownsea was easy to begin with and then became more intense as we moved out into the open, choppy waters. There was no room for complacency as the waves/chop regularly lifted the bow out of the water and delivered a pleasing ‘slap’ upon returning. In spite of the wind and waves we were in the shelter of Brownsea within an hour or so and then headed West – into the wind – to circle the island. Initially the island offered some shelter but as we got closer to the western headland making progress was challenging, at the very end we were probably at less than walking space but once we turned the corner, we had turned a corner and progress became less demanding physically but required some moving around in the boat to get trim right for the conditions – a very practical demonstration of how trim/wind interact. With the wind now at our backs Adie and John got their sails out and were soon whizzing up, down and around the island. 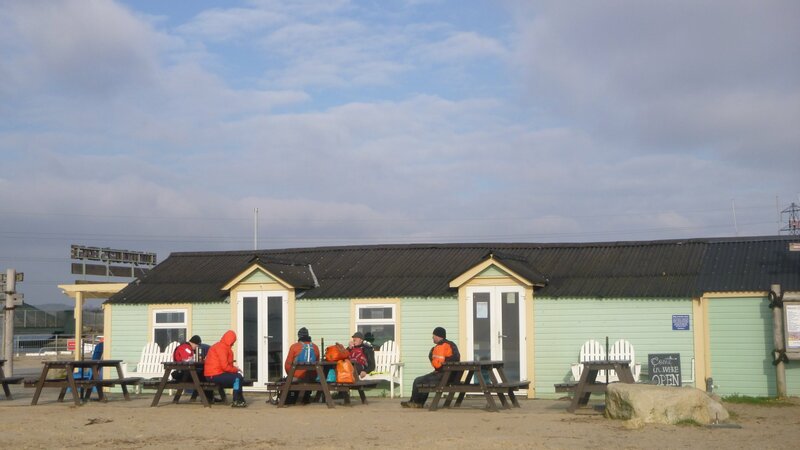 We stopped for lunch at Shard beach – so called because of the vast amounts of broken pottery on the foreshore – and were very jealous of the additional layer of clothing that Phil took out of his bag and donned because it was Baltic cold! 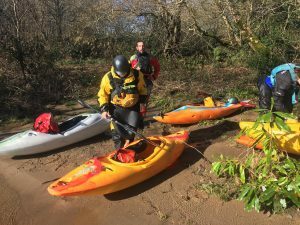 We didn’t dally on the beach and as we continued around the island the paddling became much easier as we now had some wind assistance. Before too long we were more or less back where we had crossed (Ferry No 3, now an oyster farm) and headed back towards Lilliput. Luckily as the wind had dropped we didn’t need to concentrate as much as on the outward leg and could take it fairly easy. We landed around 13.30 and thanks to our fab waterside location we were warm, dry, changed etc really quickly 😊 And then there was cake, multiple cakes in fact thanks to Linda’s thoughtfulness, and yes six of us did eat two cakes! Saturday evening necessitated another pub trip which coincided with both of the Poole RNLI RIBs launching to a ‘people in the water’ shout as we walked past – thank you RNLI for all that you do. Our Sunday plan was for a coast hugging trip west and we set off (9am) on calm water and lightening skies. We crossed Parkstone Bay and headed up Backwater Channel through the Marina, along the Quay and under the two lifting bridgesb- the old lifting bridge was kind enough to show us how she worked but we were left to try and figure out how the ‘twin sails’ bridge might let tall vessels pass under. 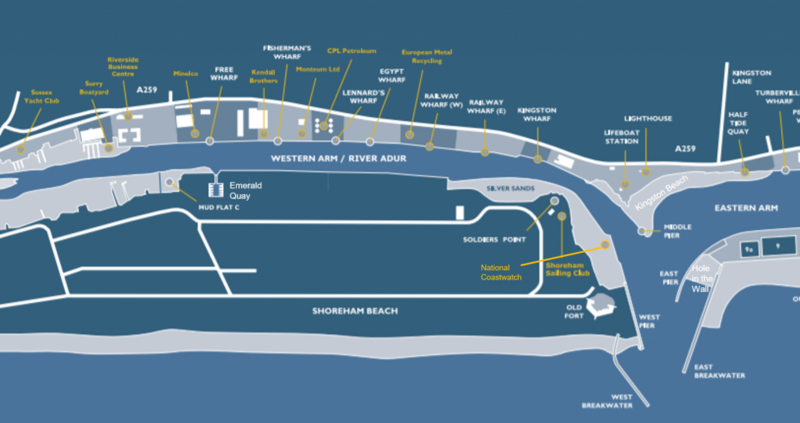 We went as far north as the RNLI college – passing many millions of pounds worth of Sunseeker hardware en route – where we docked at a fairly disused set of steps for a leg-stretch and hot drink to counter the chilly weather. For info the College has a super toasty reception and fab toilets! Once refreshed we headed back the way we came but then hung a right at the harbour and paddled westerly past the Poole-Cherbourg ferry berth (no sign of it thankfully). As we passed Hamworthy Beach we indulged in some property voyeurism but Adie was more taken by the shrouded black craft at the Royal Marines training centre. We took another comfort break and three of us basked in the warmth of our new-found decathlon £20 ‘down’ padded jackets -top, top, tip thank you Phil 😊 By now (11.00/11.30?) we had clear blue skies and no wind which made for perfect paddling conditions albeit very cold esp. if you didn’t have a decathlon……. We paddled along the deserted but beautiful Lake Beach as far as Rockley (Rock Lea) Point which coincidentally was where the lifeboat had rescued some wildfowlers from their swamped boat the night before. We got off here for some lunch and pondered the wisdom of the café being open during the week but not at the weekend. Rather than a straight ‘out and back’ paddle John suggested we head South and cross the Wareham channel towards Arne which we did in beautiful sunshine. As we got close to the shore we saw bears, moose and wolves – honest we did Neil 😊 – and then it was turn left and run for home. John had briefed us well on what to expect from the (slightly peculiar) harbour tides and as anticipated we probably had 2 or 3 knots of tidal assistance on our way back which meant we were back at TS Gulliver not long after 2pm. **** B to G were: B. Go for it anyway, it will be character building. 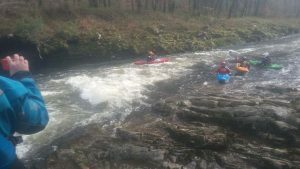 C. Change to south Wales and paddle the Usk. It will also be very low and mostly flat but there will still be some bits of white water that will run, and it doesn’t get as boney as the Dart. D. Change to north Wales and paddle the Dee and possibly the Tryweryn. 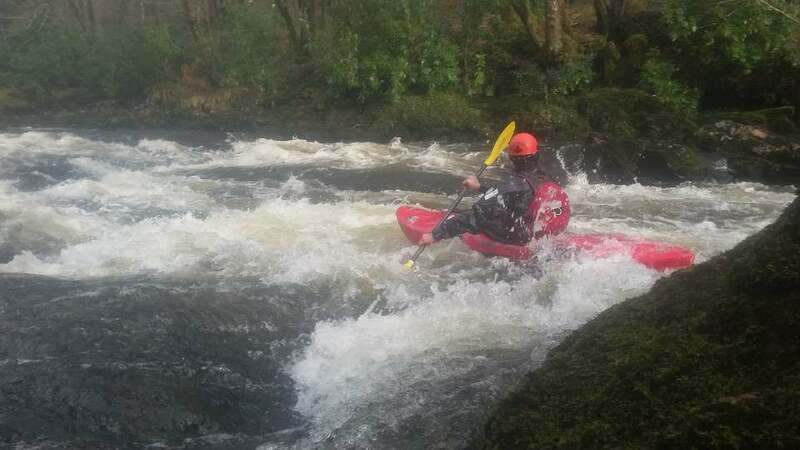 This would be the most reliable option for white water, but is a much longer drive. E. Stick with Devon and paddle the tidal Dart below Totnes. Not white water, but very beautiful and a great trip in its own right. F. Cancel the trip G. Something else. 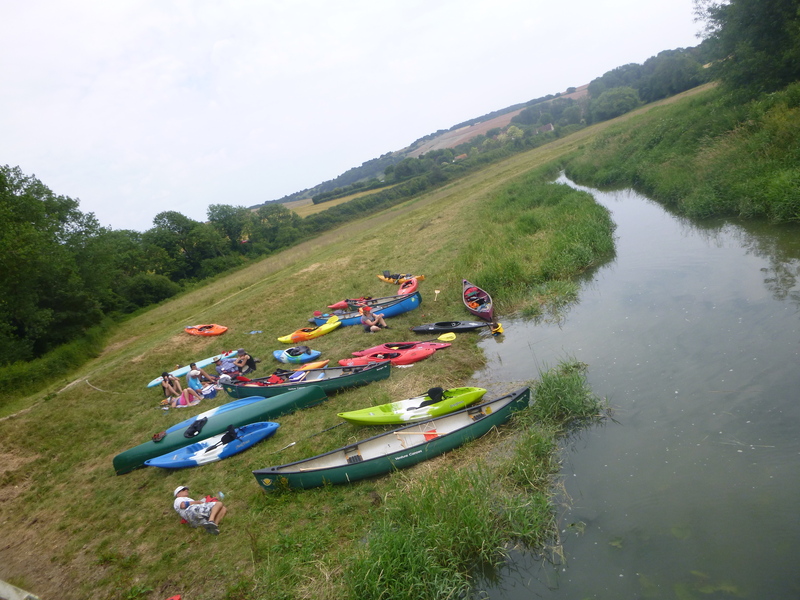 Sunday 29th April, River Ouse, Lewes town centre (Harveys Brewery) to Hamsey and back. There was a full turnout for this outing, and despite a chilly NE wind, the forecast rain didn’t arrive! 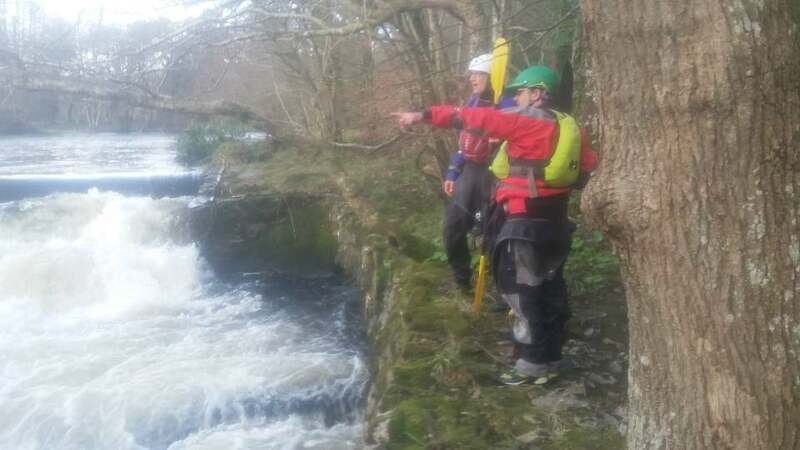 Thanks to our able coaches Cathe and Nick, we had easy launches and landings – although some of us still managed to get muddy! – and got the tides just right, i.e. upstream with incoming and downstream with outgoing. 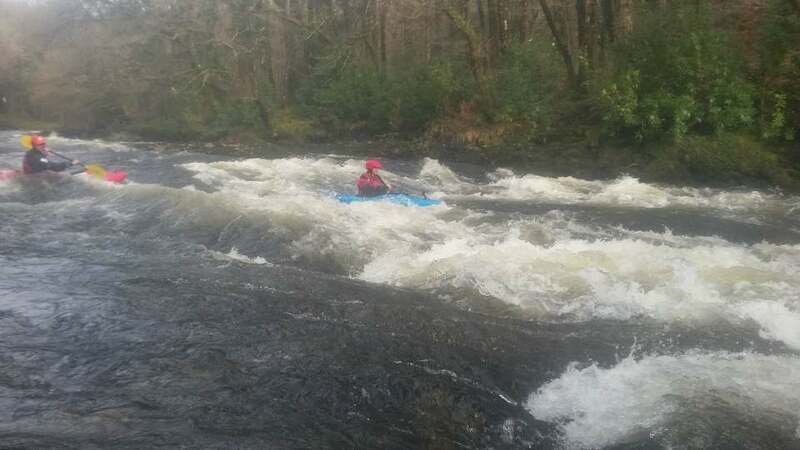 The juniors did very well, including a really good paddle upstream. Someone wise enough to know better did exploration of any waterbound trees (I think it was intentional?). We managed a welcome, if chilly ‘picnic’, including jelly babies (courtesy of Leader) at a very convenient put in at Hamsey. A great outing and thanks again to the organisers. The ACC Constitution is in need of an update to correct some changes in wording e.g. 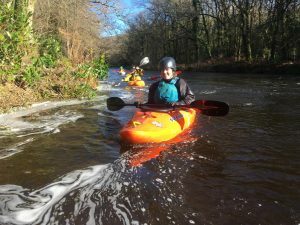 British Canoe Union is now known as British Canoeing. I have attached an updated version that I propose we adopt, it is a Word document with ‘tracked changes’ to show the amends. One change to note is the referral to additional Committee posts by name, the capping of Committee membership at fifteen and the requirement for Committee members to be paid-up club members.